At the K 2013, Greiner Extrusion and Greiner Tech.Profile reveal impressive new standards in profile extrusion. The innovative RED.LINE system created by Greiner Extrusion (GET) is raising profile extrusion quality to a new level and in the process boosting profitability for extruding companies. Resource and energy consumption are reduced while productivity and quality are increased. Greiner Tech.Profile (GTP), the “non-window“ specialist, offers a distinctive competitive advantage with its specialized tooling technologies for cable ducts and large-size profiles. In Düsseldorf from October 16-23 at the K – the most important trade show worldwide for plastics and rubber – customers and partners had the opportunity to discover for themselves the innovative force of extrusion experts, GET and GTP, under the umbrella of Greiner Tool.Tec. Düsseldorf/Nussbach, 30 October 2013 – At K 2013, Greiner Extrusion presented a wide variety of new efficiency enhancements to its products – from the RED.LINE system to advanced development of “flow.control pro” through to the new tooling system. After a successful day at the trade show, Martin Etzlstorfer, General Manager of Greiner Extrusion, was pleased to say, “With our product presentations at the K, we were again able to demonstrate our competitive advantages in extrusion through innovation.” Based on new innovations from one of the largest research and development departments in the branch, a new generation of extrusion downstreams (RED.LINE) and toolings (RED.TOOLING) has been developed. 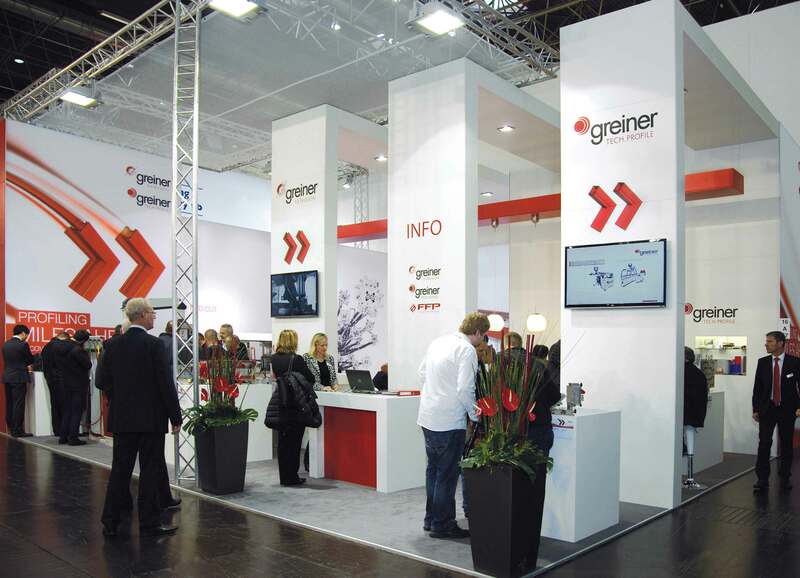 High standards and rentability are both perfectly integrated, as was impressively demonstrated by Greiner Extrusion Technology and Greiner Tech.Profile at their shared trade-fair booth at the K in Düsseldorf. GET‘s and GTP’s clear positioning under the umbrella of Greiner Tool.Tec provides for the centralized competence, creating additional customer benefits. Greiner Extrusion is the specialist for toolings and manufacturing-facility projects for window profile extrusion from PVC in the medium- to premium performance categories. Greiner Tech.Profile focuses on toolings, machines, and equipment for manufacturing technical plastic profiles for products such as cable ducts and roof gutters, as well as profiles for the electrical, construction and automotive industries. “This clear positioning with a focus on the technical profile sector holds huge potential, and it has become particularly evident at the K 2013,” claimed Richard Füßlberger, CEO of Greiner Tech.Profile. Another highlight of the trade show was the live presentation of our new cutter, RED.CUT. The excellent cutting quality and unprecedented exactness of profile separation were highly impressive. Easy and tool-less changing of the knives demonstrated savings of time and resources. PLC length measurement featured ten preselection modes available from the touch panel. It was also shown that variable adjustment of the cutting speed can be controlled from the touch panel. Accurate cutting-to-length repeatability and its PLC knife heating system were further benefits of the RED.CUT system. Greiner Extrusion is a subsidiary of Greiner Tool.Tec, and an integral part of Greiner Group. During the past 30 years, consistency and innovative thinking have made Greiner Extrusion the worldwide leader in toolings and machinery for plastic profile extrusion, and in designing complete manufacturing facilities for the production of plastic window profiles. Most major window profile extruders utilize toolings from Greiner Extrusion for their production. Greiner Tool.Tec is based at Nussbach, Upper Austria, and has 11 locations throughout the world. In 2012, the company achieved an annual sales volume of €75 million with a workforce of 783 employees.